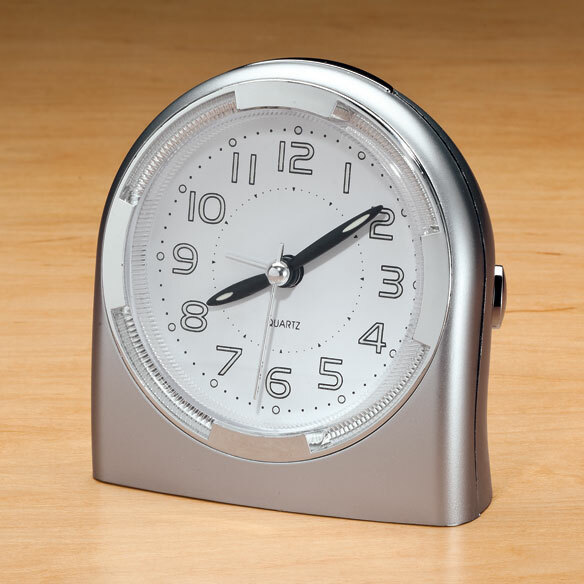 Loud alarm clock awakens even the heaviest of sleepers, and the 4-minute snooze function adds volume with each press. Features quartz analog movements. Requires 1 AA battery (not included). 3 3/4" W x 2 1/4" D x 4 1/4" H. Plastic. Hearing Aids removed? Never fail to hear!! Eureka! With all the morning appointments I have this Heavy Sleepers Alarm clock has never failed awakening me. I remove my hearing aids at night and have peace knowing I will be awakened by my clock at the precise time I set it for. I am so glad I don't have to worry about hearing the alarm. Like very much. Size good, does wake you up. Do not bother, alarm is no way loud. Bought for my mom who is hard of hearing, I have very good hearing and this clock is very low sounding. Because my wife wanted this. I needed an alarm clock. My old clock this size is falling apart. I like to idea of being able to see the 'numbers' in the dark; love it. I never hear my alarm clock. Because I need an alarm clock. Glow in the dark face regular face .... not digital. I have a family member who doesn't hear most alarm clocks. Hope this will help! Son has very early waking hour for job and he has overslept in past. I needed a loud alarm clock but haven't found one so I am gonna try this one. this one you can hear. Others you can not. I have been looking for a alarm that actually will wake me up. Hope this works. I needed this kind of clock in my den for when I'm watching TV. MY 13 YEAR OLD NEPHEW NEEDS A LOUD ALARM CLOCK TO WAKE HIM UP IN THE MORNING TO GO TO SCHOOL. I HOPE THIS HELPS, BECAUSE MY NEXT STEP IS TO THROW A BUCKET OF COLD WATER ON HIM. lost my hearing a couple of years ago need a good alarm clock to wake me up. hope this will do the trick. Glow in the dark hands. I need a LOUD alarm clock. Hoping this will do the job. i had owned this alarm clock before & it worked very well. It lasted a long time. I had ruined my clock by forgetting to change the little battery, so the result - the battery had leaked inside and that's how my clock got ruined. This time I am ordering 2 new ones & marking down when I put the battery in for the future. wish there were answers to all thoses responses. i need a loud alarm to wake me up as i too wear hearing aids & do not wear them to sleep. theres not always someone at home to see that i get up on time. so is it really loud ? BEST ANSWER: It is quite loud. Also it has a setting for vibration if you want. The combination of loudness and vibration always wakes me. Yes, it is loud and long. I love mine. BEST ANSWER: It is very easy to set! Simply open the back, turn the nob on the left to a new time and close it an set the alarm on. Yes, it is. You set it from where you put in the batteries. I love mine. BEST ANSWER: Yes However it depends upon your hearing . HOW LONG DOES THE ALARM SOUNDS?